Sharing the road with semi-trucks can be nerve-racking and there are a few things that every driver needs to keep in mind about semi-trucks that can help everyone have a safe trip. Drivers must be conscious about a trucker’s slower braking systems, blind areas and traditional trucking habits. Knowledge about these facts can help drivers prevent accidents. Smaller vehicles need to understand that a semi-truck’s weight makes it more difficult for them to stop. It takes a lot longer for a loaded-down truck to fully brake than it does for a smaller vehicle, so it’s important to keep this in mind when sharing the road with a semi. The large body of a truck also makes it more difficult for them to see smaller vehicles that are in their rear or side view, so pay attention not to stay in a truck’s blind spot for too long. It’s okay to utilize blind spots for passing purposes, but there is no reason to stay in a blind area. Finally, recognize that truckers try to stay in the right-hand lane for the most part. Faster moving traffic should utilize the left lane to pass truckers, and you should never attempt to crowd or tail a semi in an attempt to get them to go faster. Surprisingly, over 80 percent of all accidents between large semi-trucks and smaller vehicles are caused by the smaller vehicle. Unfortunately, the smaller cars are much more likely to suffer damage and its passengers more likely to be injured due to the truck’s size. 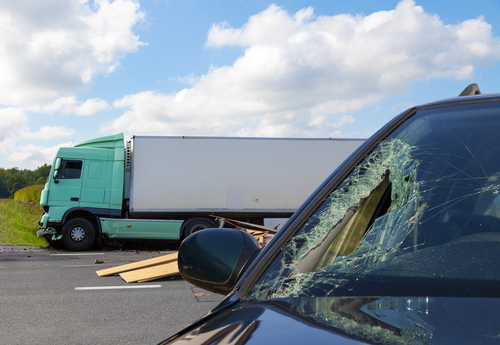 The personal injury attorneys at Team Law know how catastrophic a collision with a semi-truck can be. Don’t hesitate to reach out to a legal representative when you’ve been injured in an accident. Contact the attorneys at Team Law at 1-800-832-6529.